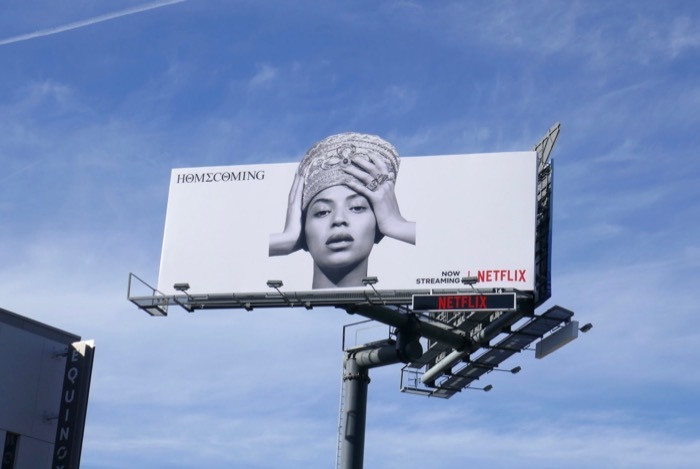 If you're not fortunate to attend the second weekend of the Coachella Valley Music and Arts Festival in Southern California this weekend then don't despair, as Netflix can transport you to last year's spectacle with Homecoming: A Film by Beyoncé when she headlined the outdoor annual event. 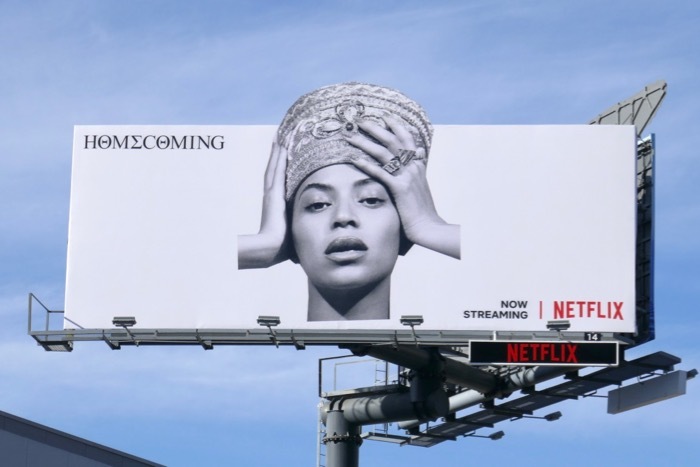 The superstar solo artist and Destiny's Child founding member directs and takes the spotlight in her own documentary concert movie, which is a triumphant self-portrait of an artist and weaves together rehearsal footage, conceptual planning and live performances that celebrates both black culture and her hit-making discography. 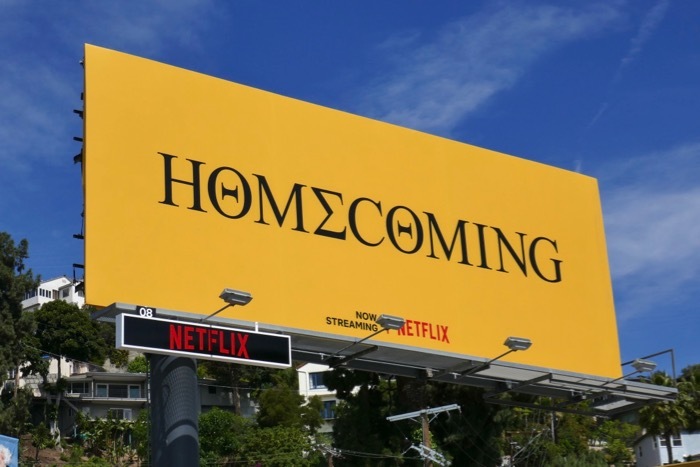 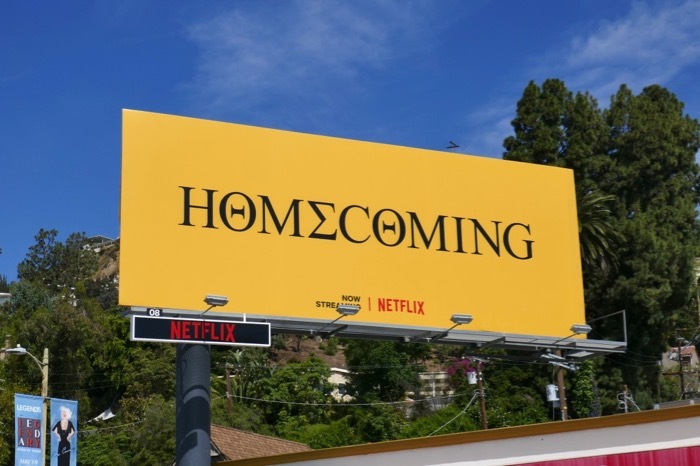 These Homecoming billboards were snapped along West Hollywood's Sunset Strip on April 18, 2019. 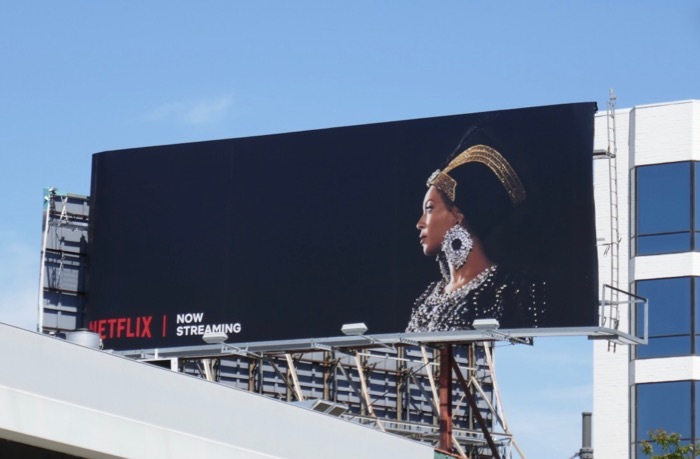 Fans of the Queen B can also enjoy these fabulous Beyoncé Life Is But a Dream documentary billboards, these Pepsi Live For Now billboards and these On The Run concert billboards. 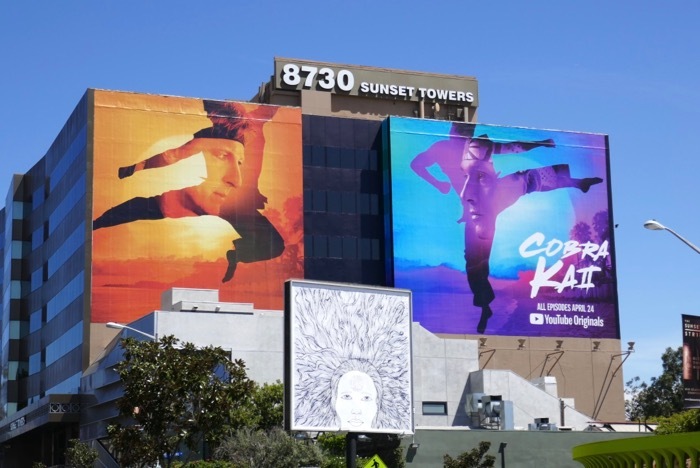 Go behind-the-scenes of a true visionary and immerse yourself in the music, the choreography, the dancers, the marching band, the costumes, the imagery and the performance of a cultural icon who is an inspiration to so many. 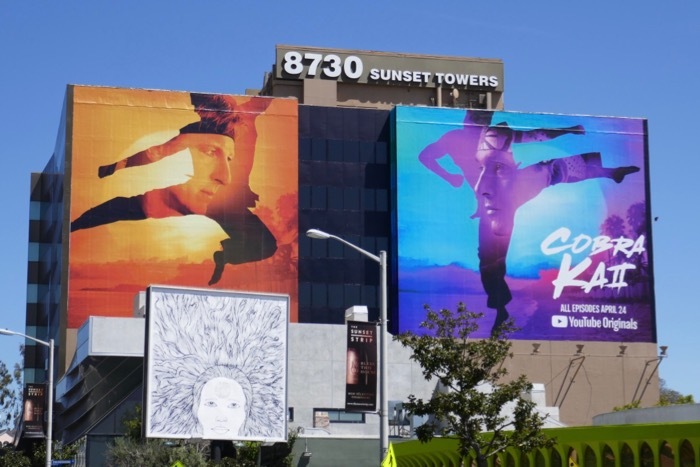 Can't go to Coachella this year, then 'Nochella' with Beyoncé instead. 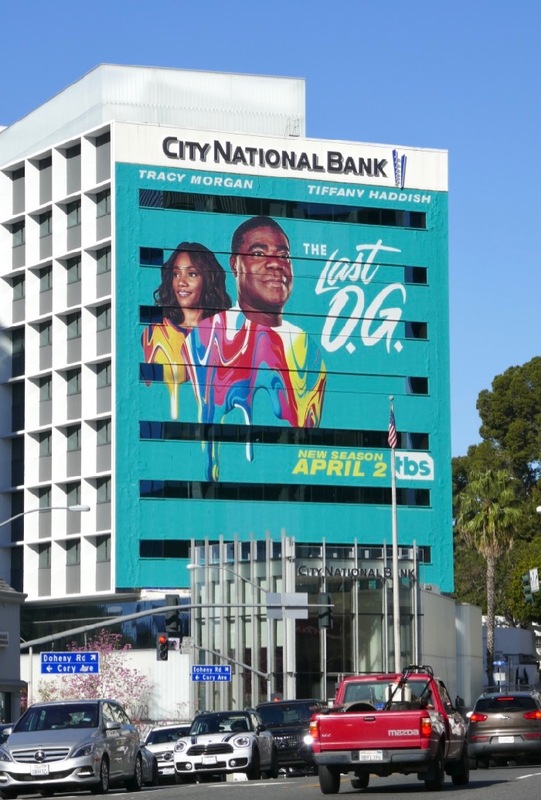 This April Tracy Morgan is back as 'Tray' and living life in full colour after spending fifteen years incarcerated in the sophomore season of his TBS comedy set in Brooklyn, The Last O.G. 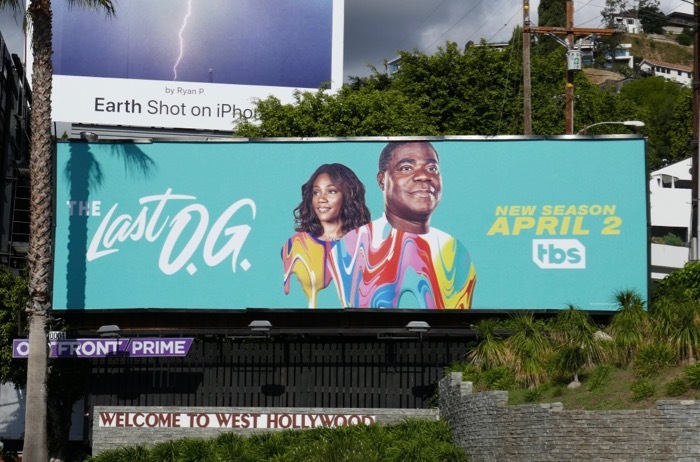 After focusing on his post-prison life in the first season, in these all-new episodes we'll get to see what his girlfriend at the time (played by Tiffany Haddish) did during that time, like giving birth to his twin children and getting married to someone else. 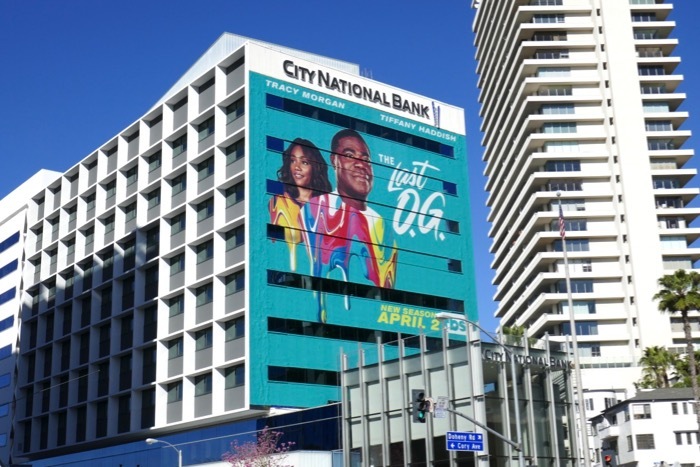 These vibrant sophomore season billboards for the sitcom were captured along the Sunset Strip from March 29 to April 5, 2019. 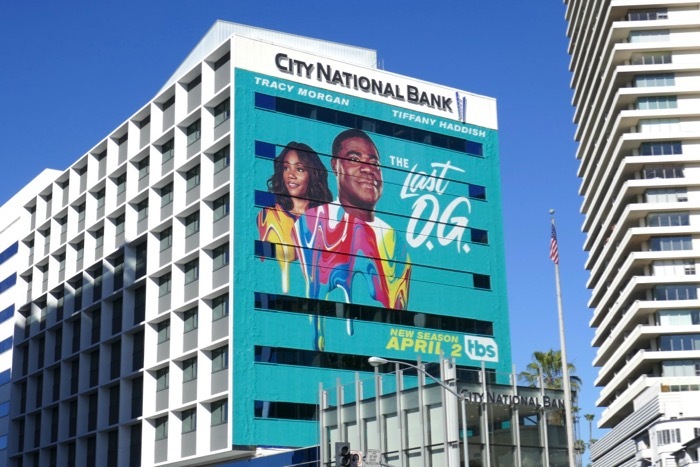 Fans of the TBS show can also check out these season one and awards consideration billboards for The Last O.G. 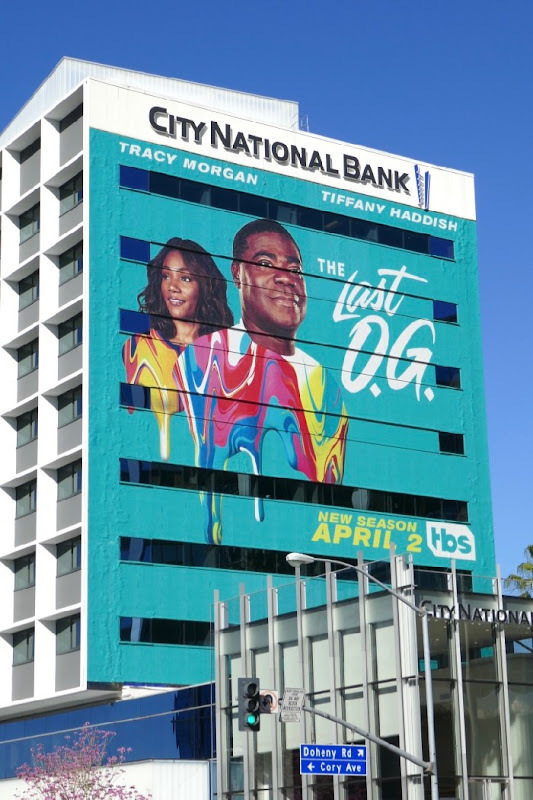 Fans of Tracy Morgan can also check out this Cop Out movie billboard and this 30 Rock billboard, whilst for more of Tiffany Haddish make sure you take a look at these Night School movie billboards and these Girls Trip film billboards. 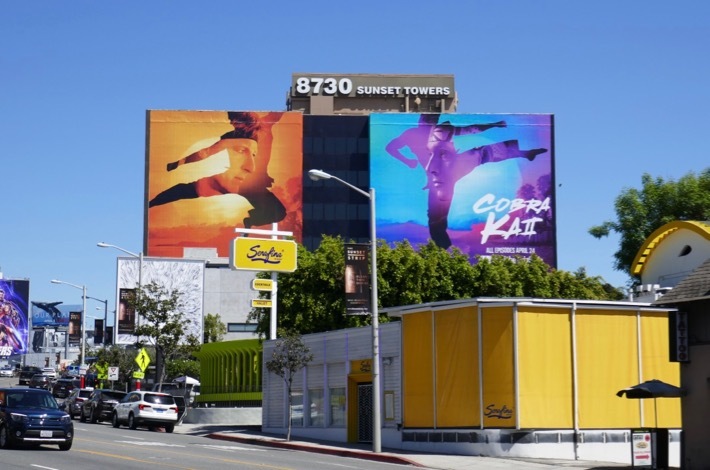 May the rest of your day be as colourful as these season two billboards are. 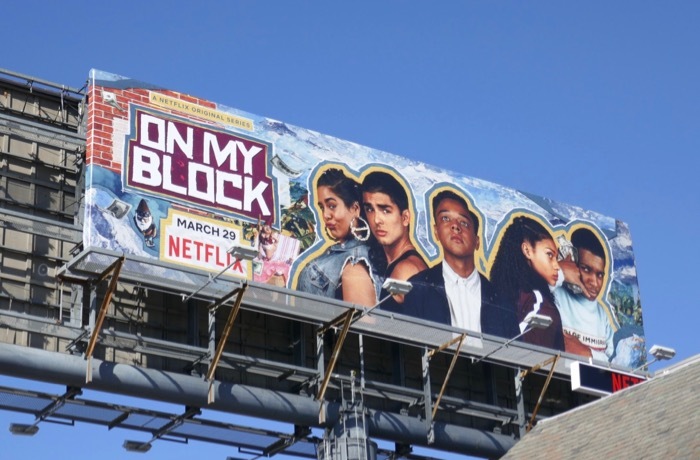 Netflix may not have given the launch of On My Block much outdoor support, but the streaming giant is certainly making up for it with the show's second season if these billboards are anything to go by. 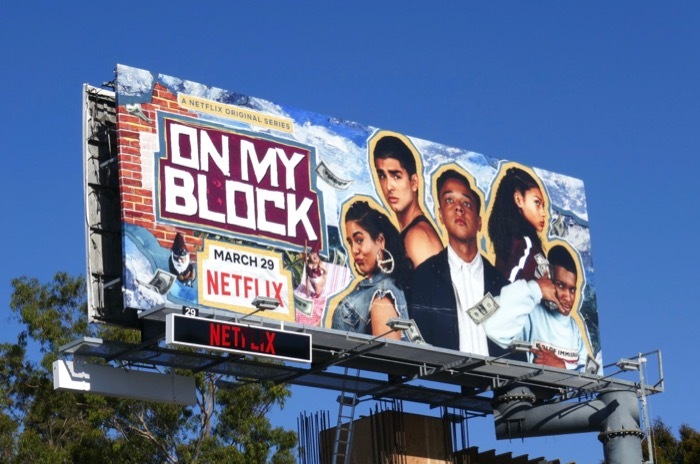 The coming-of-age comedy series follows four friends, 'Monse' (Sierra Capri), 'Jamal' (Brett Gray), 'Ruby' (Jason Genao) and 'Cesar' (Diego Tinoco) and their classmate 'Jasmine' (Jessica Marie Garcia) from a rough inner-city Los Angeles neighbourhood whose bond is tested navigating their way through high school. 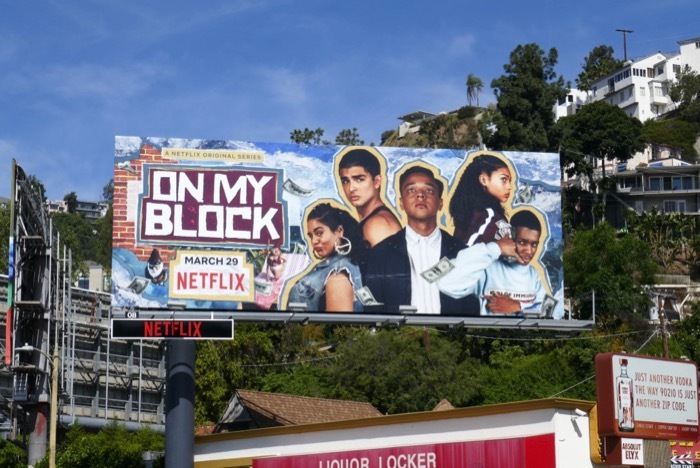 The teen dramedy shines a light on issues that young people of colour face in L.A. like the deportation of parents, gang culture and gun violence, but shows they are not defined by these things. 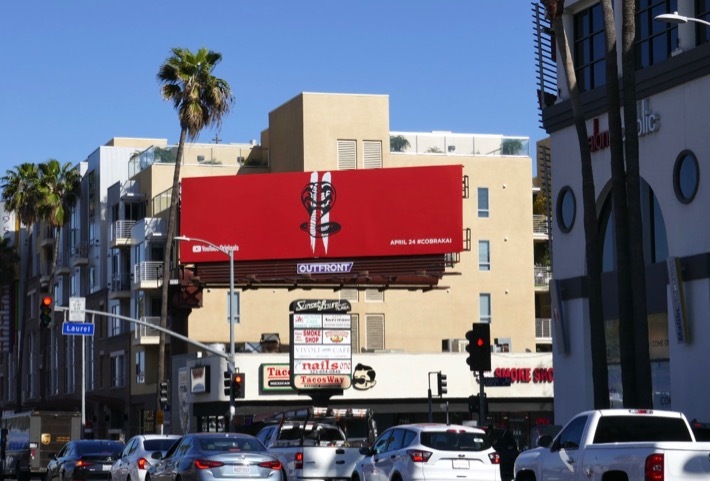 These sophomore season billboards were snapped along West Hollywood's Sunset Strip on March 29, 2019. 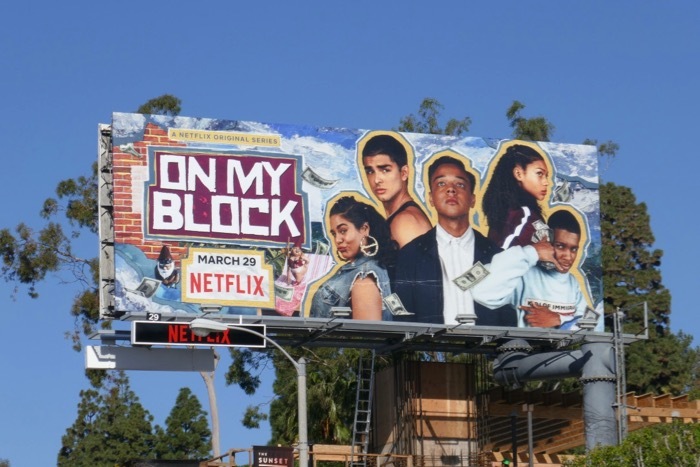 With Netflix cancelling so many shows of late, let's see whether school will be in session for On My Block for a third season in the future. 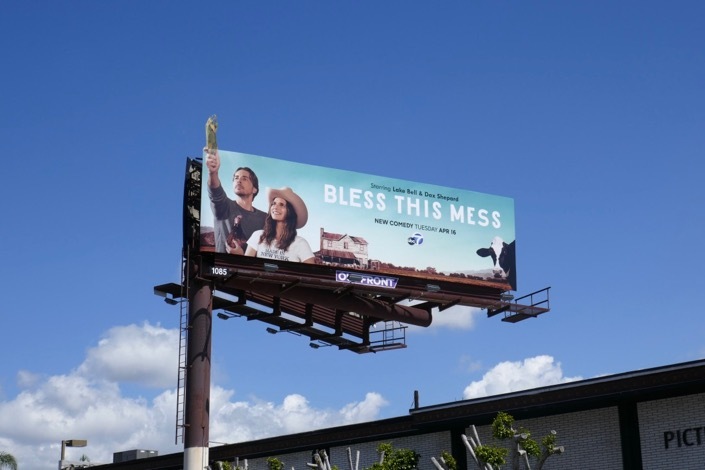 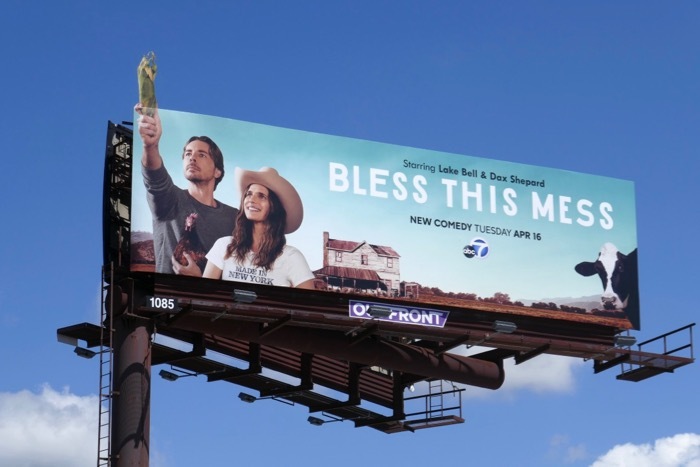 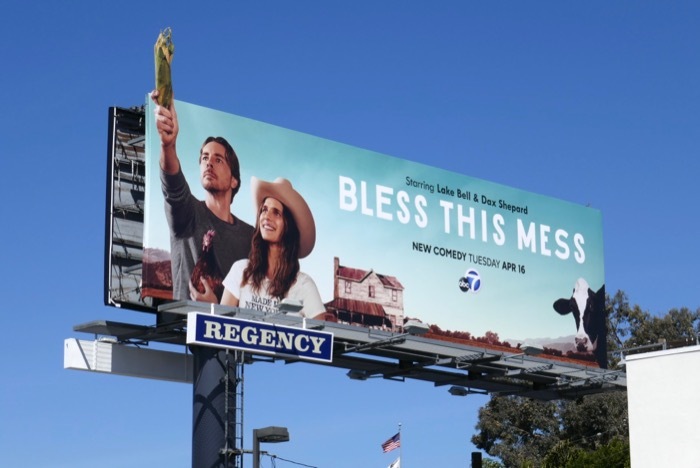 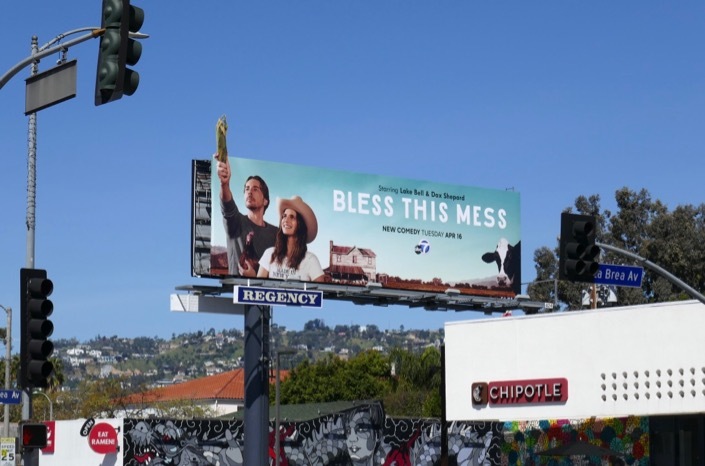 If you're looking for a much needed laugh, then maybe ABC's new fish-out-of-water comedy Bless This Mess will be able to supply some udderly refreshing chuckles this season. 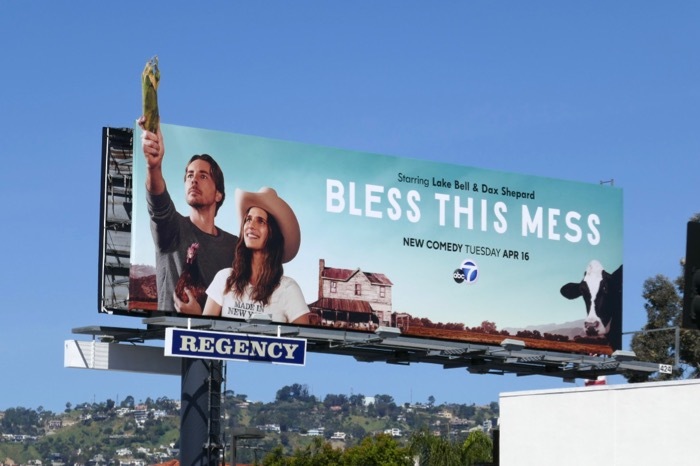 Dax Shepard and Lake Bell star as the recently married couple who inherit a rural Nebraska farm and leave the rat race of New York City to try their hands at growing alfalfa, despite being clueless about agriculture. 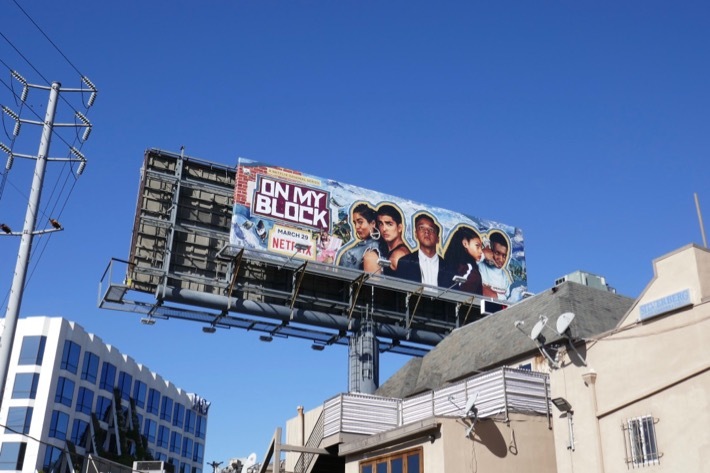 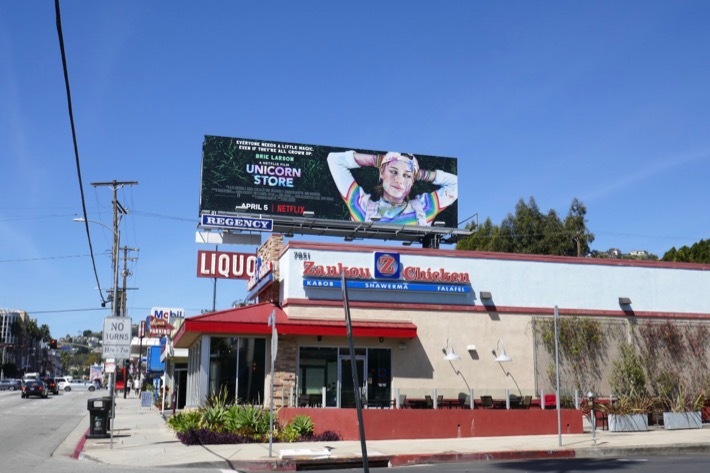 These special extension cut-out billboard were spotted standing out along Melrose Avenue and Vine Street on March 27, 2019. 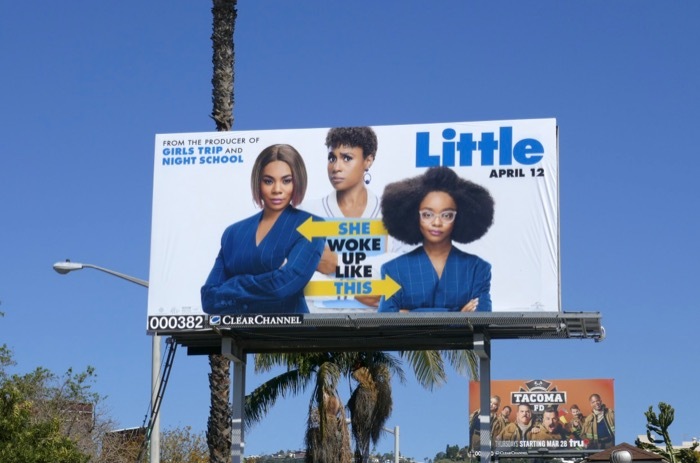 Fans of Dax Shepard can also check out these CHiPs movie remake billboards from 2017. 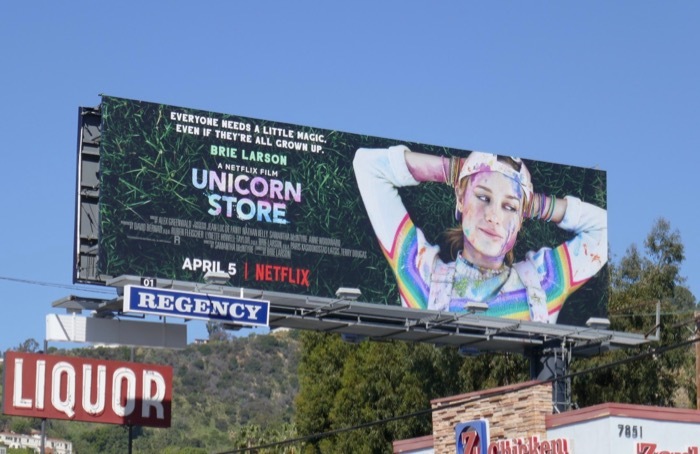 Can this music journalist and therapist make it as farmers, or will they live to regret giving up the skyscrapers for a not-so-simple life on the farmstead? 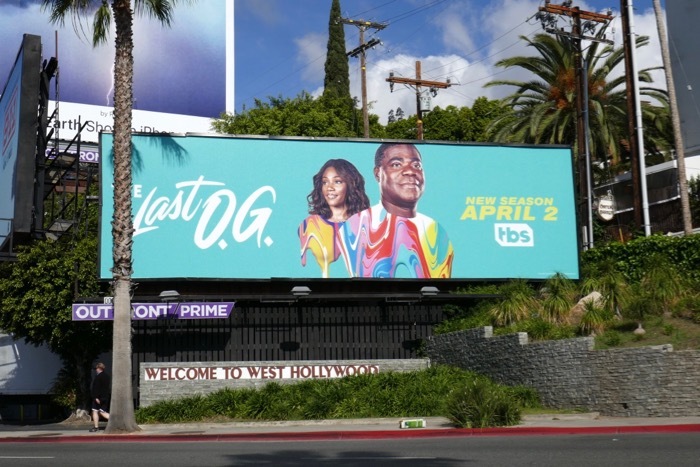 Only time will tell whether audiences will grow to love this messy new sitcom. 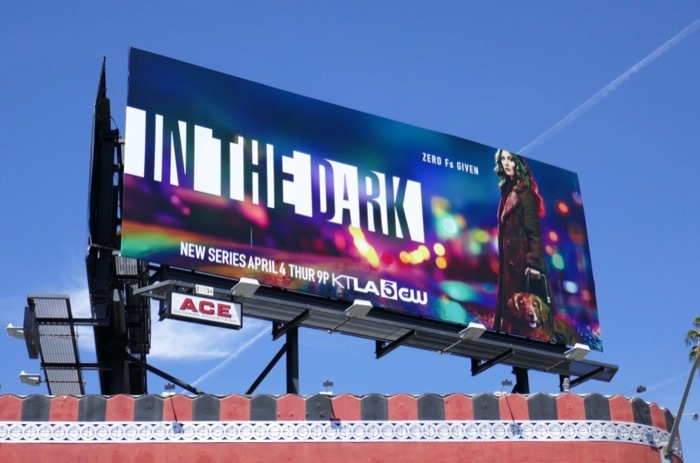 This spring taking a break from superhero, high school and supernatural shenanigans, The CW headed In The Dark with its new comedy drama starring Perry Mattfeld. 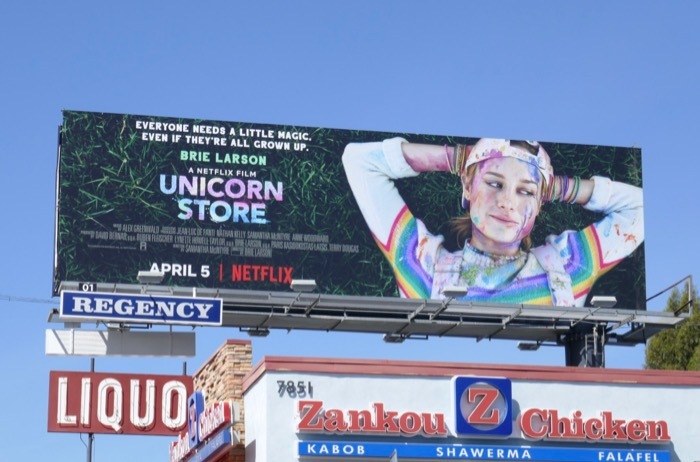 The actress plays an irreverent twenty-something blind woman named 'Murphy' who drifts through life in a drunken haze with a few friends and her guide dog 'Pretzel'. 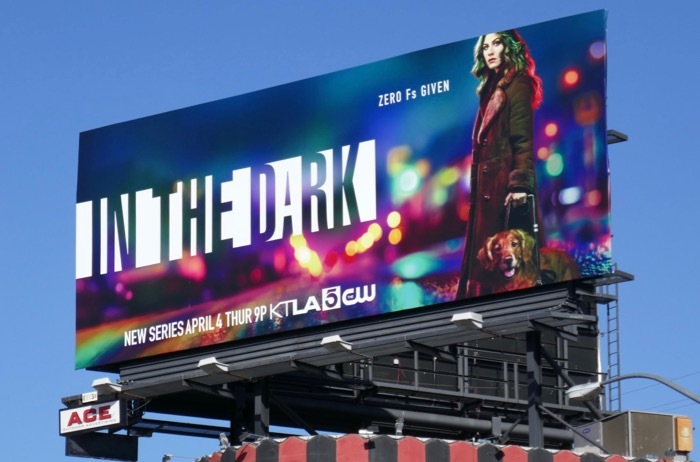 When one of her friends, 'Tyson', a teenage drug-dealer who once saved her from a violent mugging turns up dead, she resolves to find his killer when his body disappears and the police don't seem inclined to investigate. 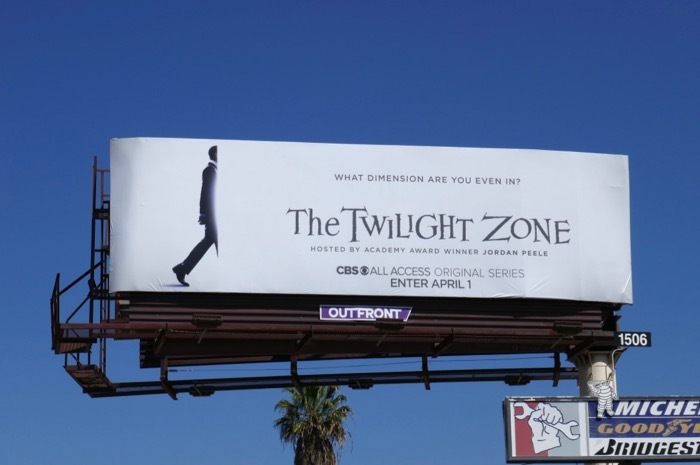 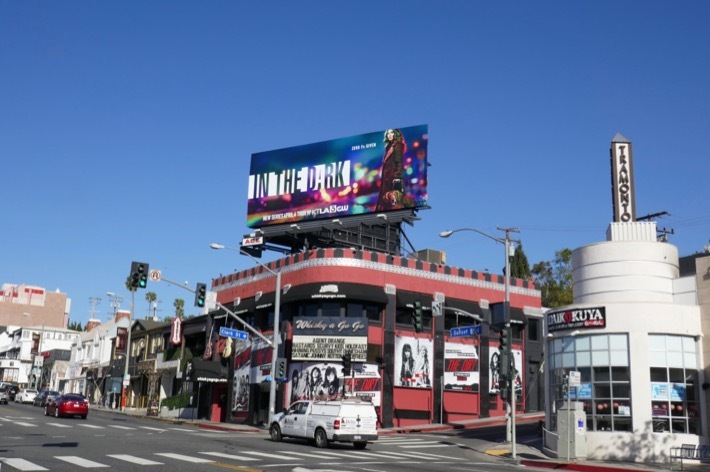 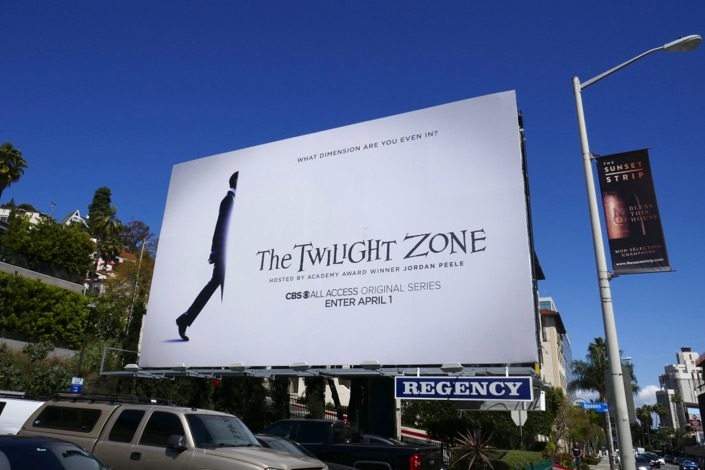 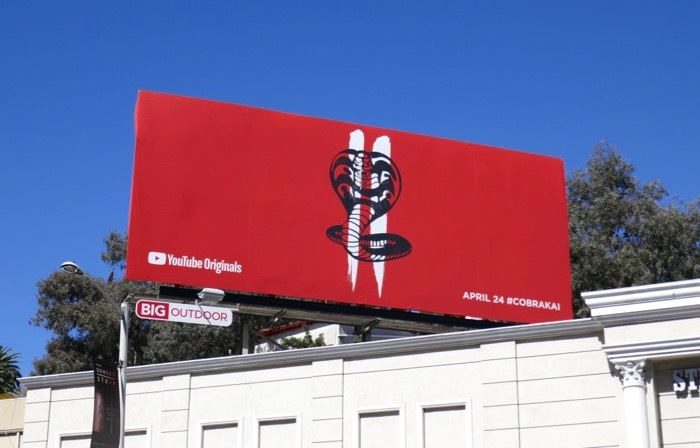 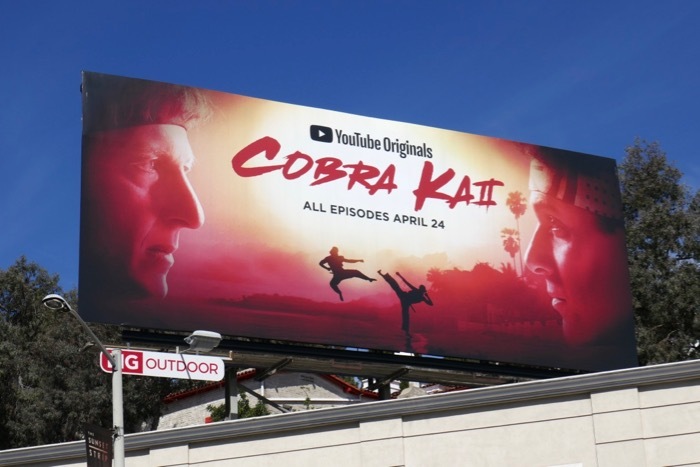 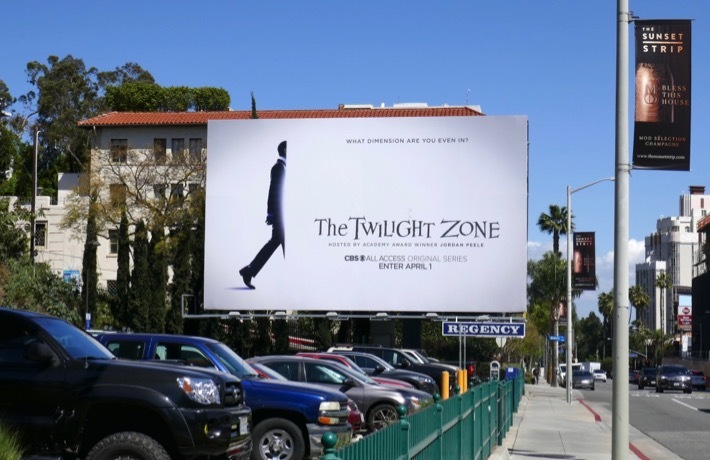 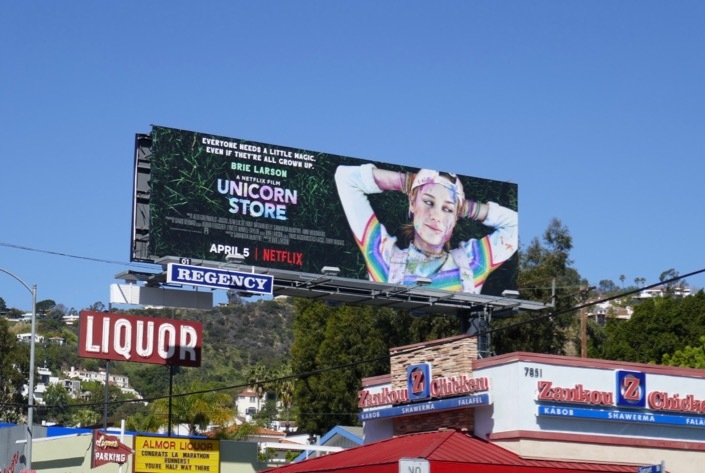 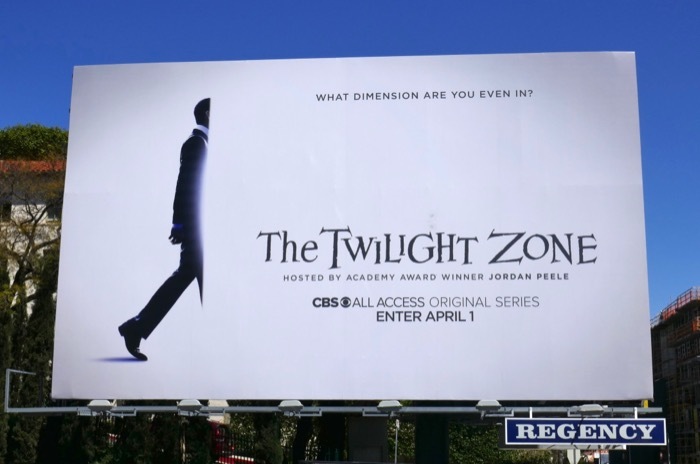 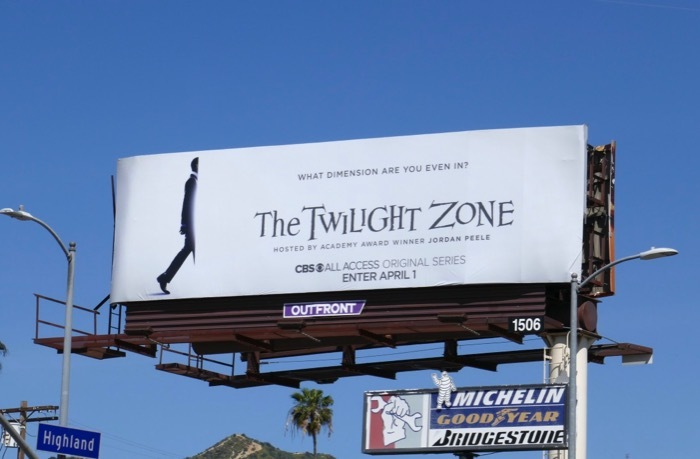 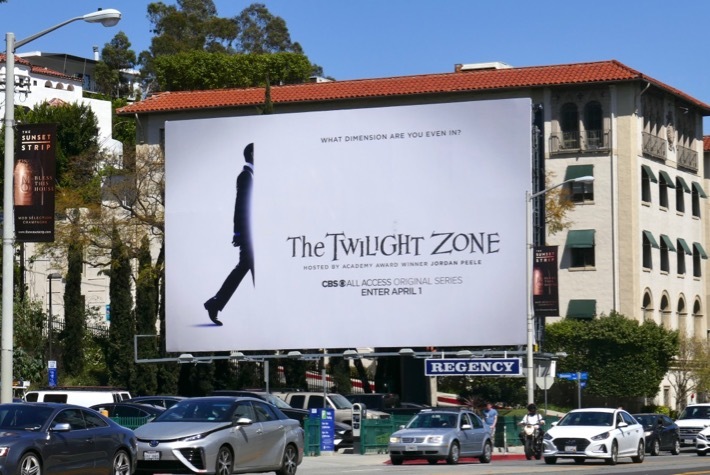 This series launch billboard was snapped along West Hollywood's Sunset Strip on March 29, 2019. 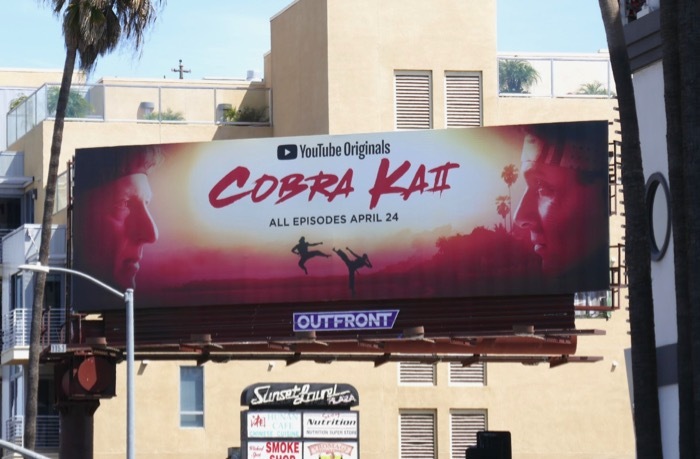 For more TV shows with blind characters, make sure you also check out these Growing Up Fisher billboards and these Daredevil billboards. 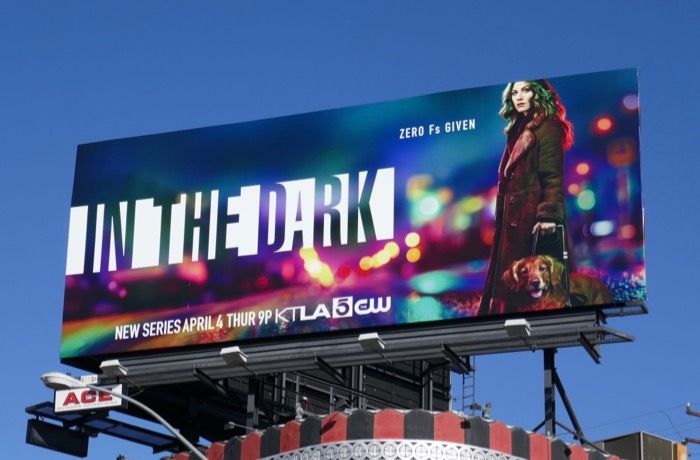 Only time will tell whether the cynical, hard-drinking Murphy can balance her romantic life, her job at a service dog center and her amateur sleuthing, and make audiences want to tune in to watch her each week. 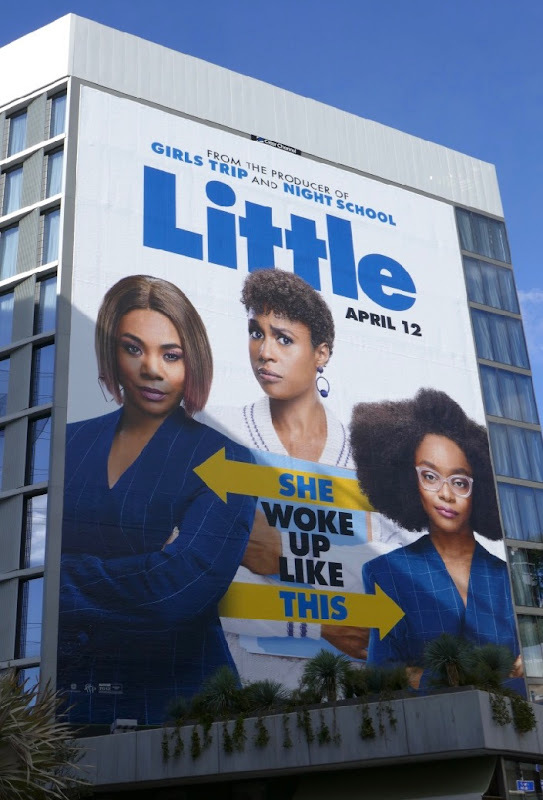 Following in the footsteps of body-swapping antics like Big, 13 Going on 30 and 17 Again, Regina Hall finds herself transformed into a younger version of herself overnight in the new comedy, Little. 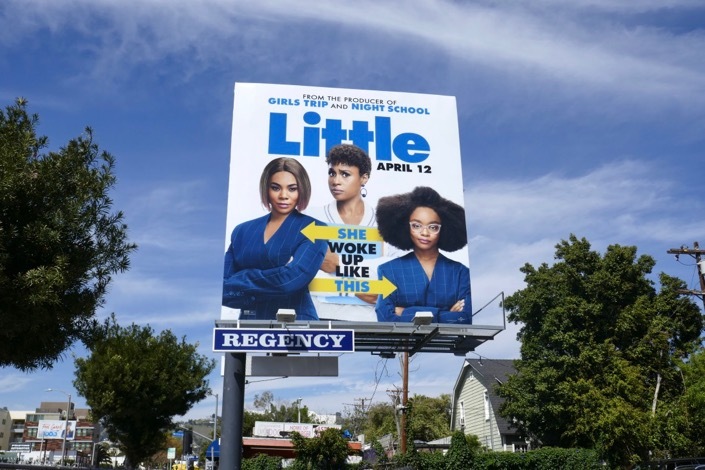 The ruthless tech mogul gets the opportunity to relive the life of her younger self (played by Marsai Martin) without the pressures of adulthood, whilst her overworked assistant (Issa Rae) gets to deal with the fine mess they find themselves in and discover a way to revert her boss to normal. 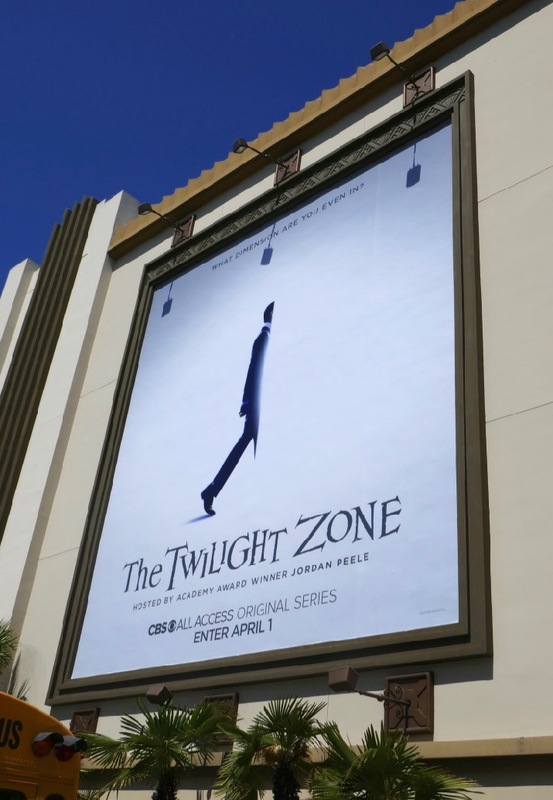 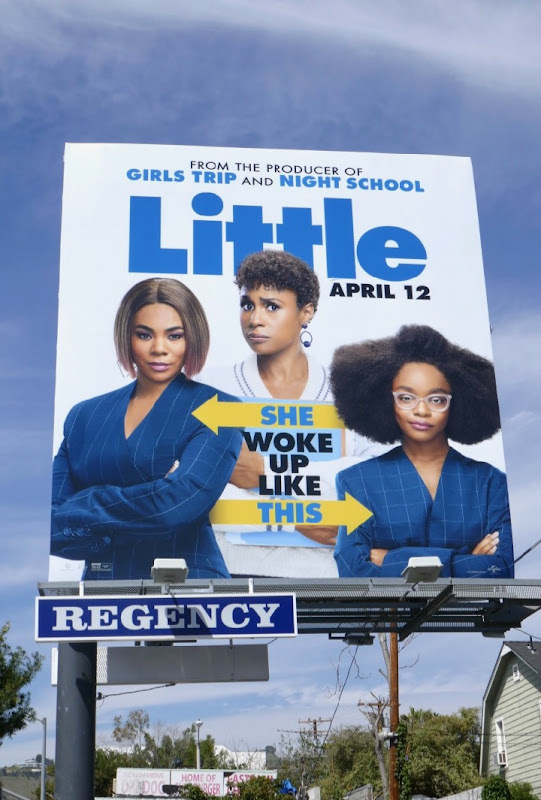 These movie billboards of all different sizes were spotted along Fairfax Avenue, La Brea Avenue and the Sunset Strip from March 17 to April 7, 2019. 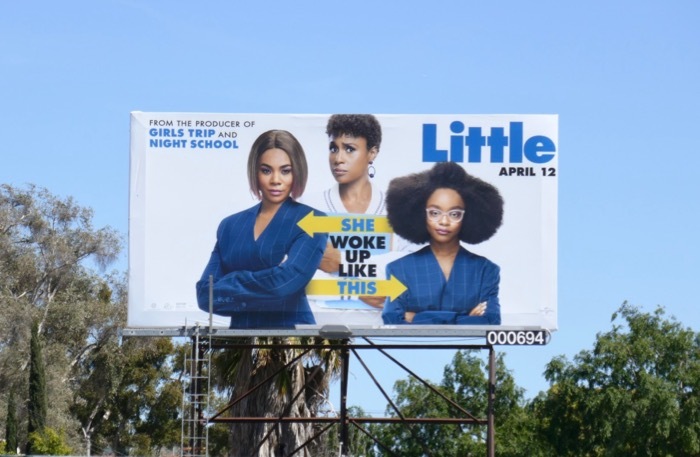 Regina Hall admirers can enjoy these Girls Trip movie billboards and these Black Monday billboards, Issa Rae fans can check out these Insecure billboards and you can see more of Marsai Martin in these Black-ish billboards. 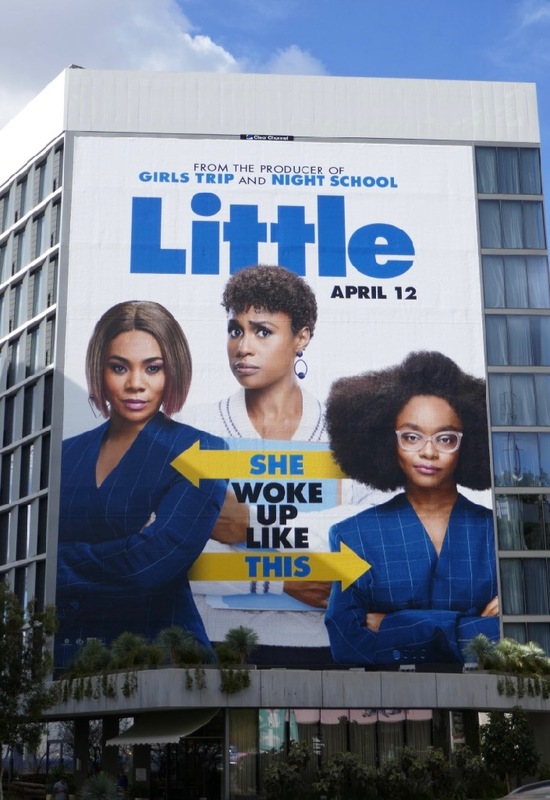 Here's hoping this new comedy can follow in the big box office success of Girls Trip and has more than a few little laughs this weekend. 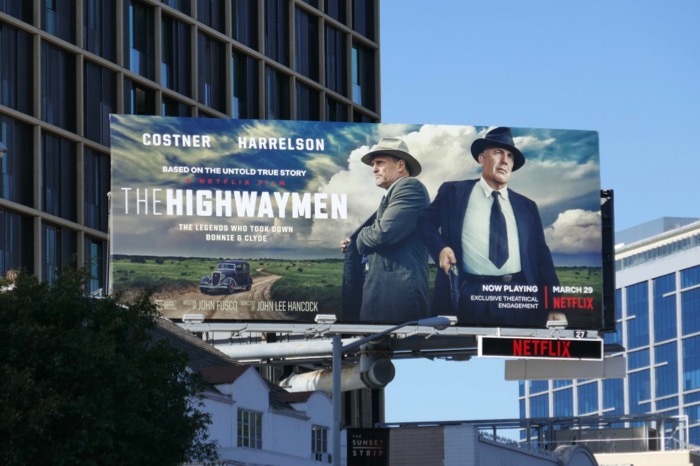 Netflix's new original film directed by John Lee Hancock, The Highwaymen, tells the untold true story of the men who took down notorious criminals, Bonnie & Clyde. 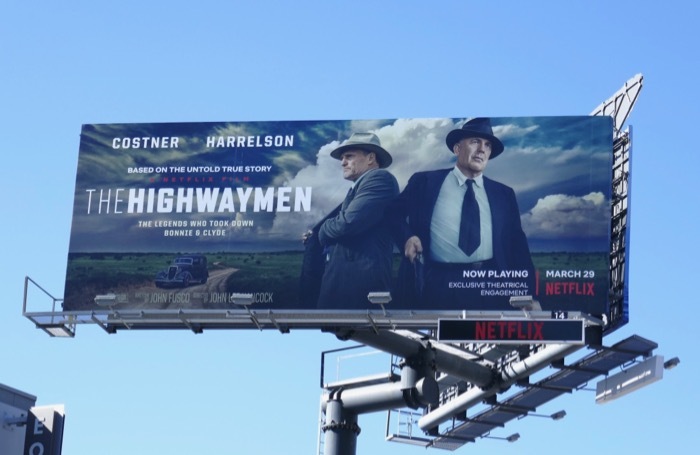 After the murderous robbers break their associates out of a Texas prison in 1934, the state's Governor hires former Texas Rangers 'Frank Hamer' (Kevin Costner) and his old partner 'Maney Gault' (Woody Harrelson) out of retirement to track down the deadly fugitives independent of the FBI. 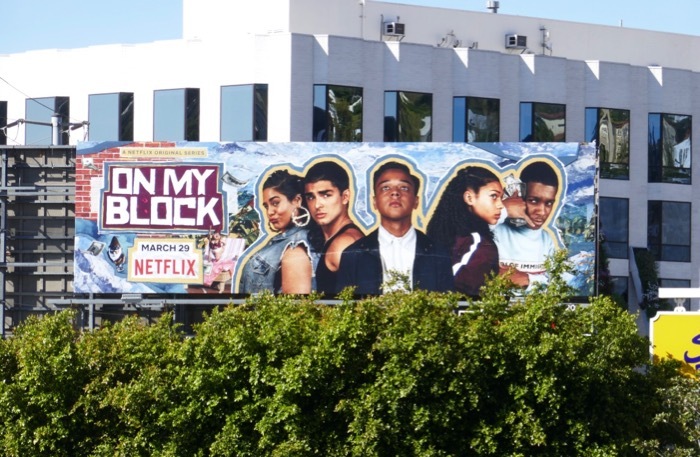 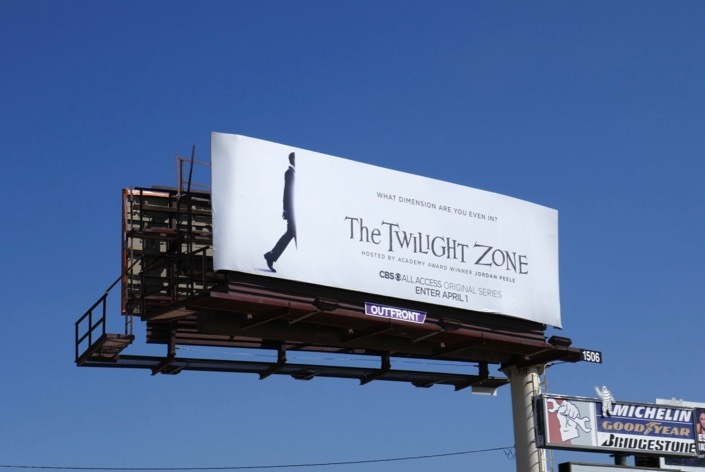 These movie billboards were spotted above Beverly Boulevard and the Sunset Strip from March 27 to March 29, 2019. 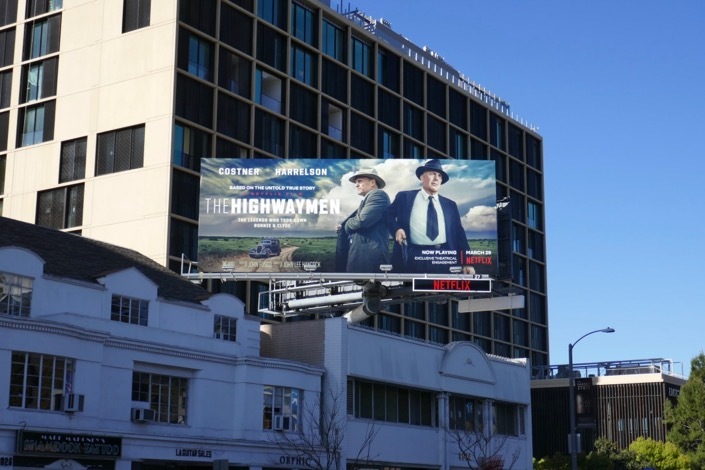 For the other side of the story, make sure you also check out these Bonnie & Clyde mini-series billboards from 2013. 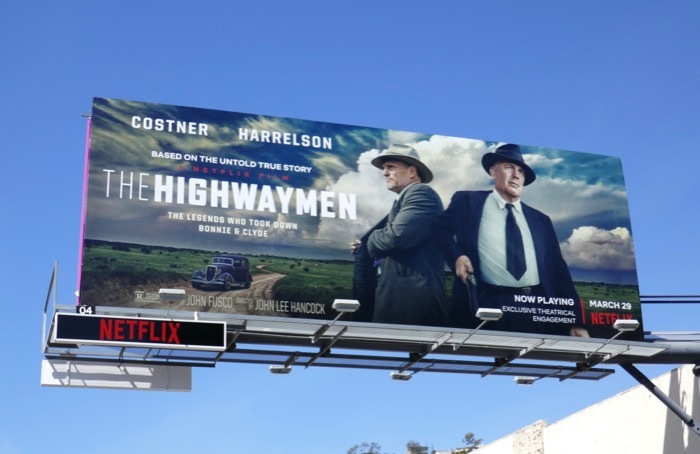 Kevin Costner fans can also check out these Draft Day movie billboards and these Criminal movie billboards. 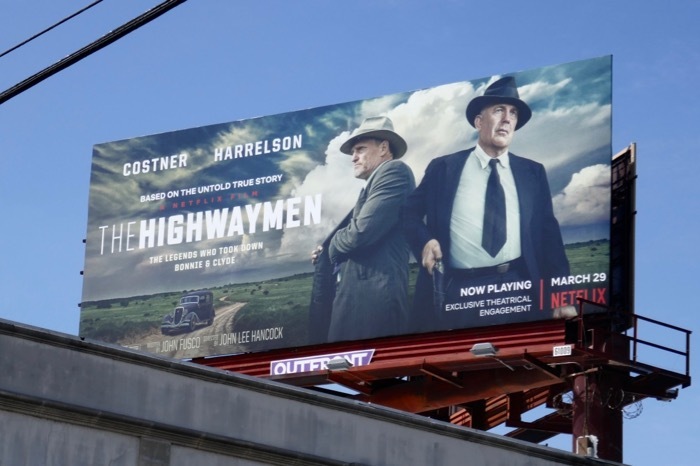 Meanwhile Woody Harrelson admirers can enjoy these True Detective billboards and these Solo: A Star Wars Story billboards. 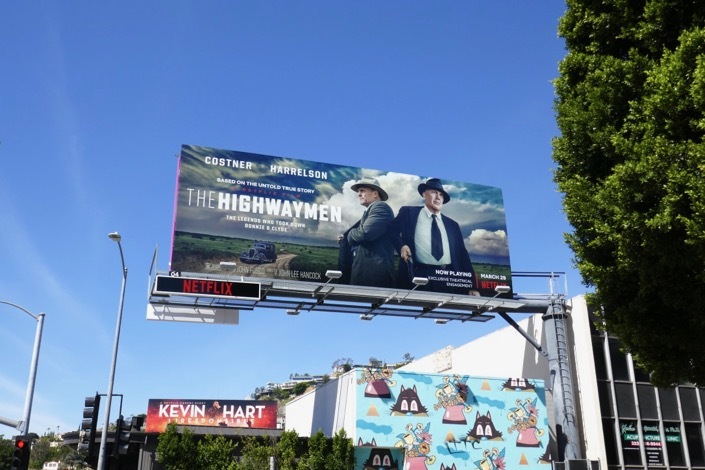 The infamous outlaws may have made headlines, but these legendary lawmen made history by using their gut instincts and old school skills to get the job done where others failed.